Make a phone call? Do 20 push-ups? Take an elevator to the 10th floor? You will be amazed what the people at La Perla Pizzeria can do in 90 seconds. The authentic Italian pizzeria can cook a delicious pizza in just a minute and a half. La Perla makes its own mozzarella and hand-tossed dough. 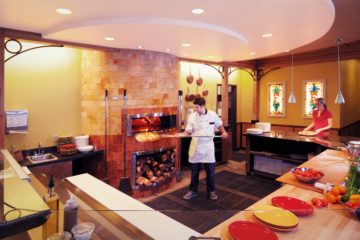 The restaurant also uses imported ingredients and cooks in a wood-burning oven. La Perla offers a variety of traditional pizzas, including margherita, Napolitan and marinara. Toppings include sausage, marinated mushrooms, artichokes and ham, among others. Located at 1313 Pearl St., La Perla replaced the Pearl Street Ice Cream Parlour. Gianni Barofsky, owner of La Perla and Beppe & Gianni’s Trattoria, said the restaurant aspires to become Verace Pizza Napoletana certified soon. Verace Pizza Napoletana is a movement to protect the Napoletana style of pizza that is a tradition in Naples. A representative from Naples will come to the pizzeria to declare it official, and if the restaurant passes, it will be one of only 25 VPN pizzerias in the U.S.
Barofsky said he wanted his business to have an open, airy atmosphere with lots of space, windows and a new awning. La Perla definitely feels open and airy with its huge windows and skylight. Barofsky said the history of the location played a large part in the design of the business. For Barofsky, it was important to send the message that La Perla was an entirely new and unique establishment. “We didn’t want to put a pizza oven in (Pearl Street Ice Cream Parlour),” he said. Barofsky said the pizza is the best thing on the menu. La Perla Pizzeria is open seven days a week, from 5 p.m. to 11 p.m., although Barofsky said differently. Posted in Commercial, News, Publications and tagged Restaurant.